Elaine's work is a photographic experiment in search of the illusive world around us. In her latest exhibition, My Chimerical World, Elaine wants to take you to a wildly fanciful terrestrial paradise. Whether it is one plant, an ocean or a mountain range, it is her intention to make you wonder if the visions that she created were actually there when the photograph was taken. She works with the idea of there being many dimensions and her imagination creates some of them for us to see. Elaine won Best in Show from Colors of Humanity Art Gallery and several awards of excellence in Ed Wedmans Exhibition Without Walls, juried on line competitions. Several of her images are in the Admiral Lounges in JFK and Miami airports and she has her Pine Tree images decorating many rooms in the newly renovated Fairmont Royal York Hotel in Toronto. 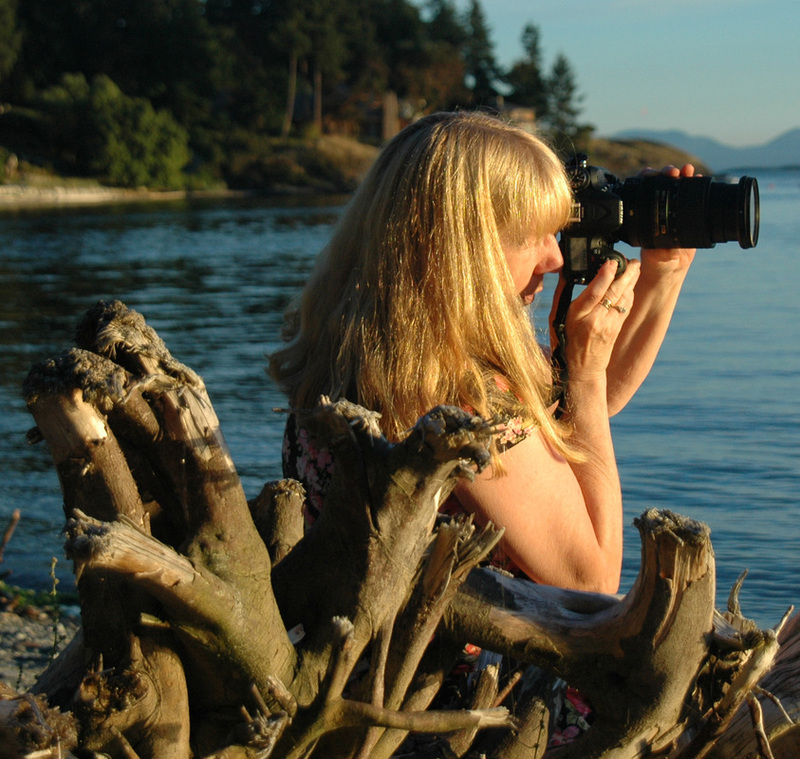 Her photography was also selected as part of the Celebrate BC Day in 2013. She has exhibited in galleries in Vancouver and the Sunshine Coast in B C Canada as well as New York, California and Europe. Elaine had a wonderful article written by Renee Phillips of Manhattan Arts International, "Elaine Hunter Creates Visionary Photographic Art", July 2014. Elaine was chosen a a finalist in The Healing Power of Art Exhibition, Manhattan Arts, April 2015 and was 3rd in Exhibition Without Walls' The Four Elements 2015. Elaine was chosen as a featured artist with Artsy Shark in June 2015. Elaine was selected as one of the TOP 40 in the 2015 LACDA 2015 Top 40 Exhibition and is now represented by LACDA. ​( Los Angeles Center for Digital Art). Elaine won BEST IN SHOW with CAGO Weather Exhibition, November 2015, was selected as a finalist in the New Beginnings Exhibition of Manhattan Arts International, December 2015 and was a finalist in the Gala Awards , Julia Margaret Cameron, Fine Arts Category, December 2014 and 2015 and 2016, she will be exhibiting in the 5th BIENNIAL OF FINE ART AND DOCUMENTARY PHOTOGRAPHY, Barcelona Oct. 2018. In November 2016 Elaine won another Best in show from CAGO for her "Storm Over Toronto" Image. Elaine was a finalist in the 10th Pollux Awards August 2017, with her series Reflections and also in Photographers Forum magazine August 2017 with her image Orange Blossom. Elaine will be exhibiting her series reflections in Vancouver April 2018. She won the James Bacchi Arthaus Gallery Award as part of the New Beginnings Exhibition with Manhattan Arts International, January 2018. Elaine will be exhibiting in Peformance Works , Granville Island March - May 2018, this exhibit is her Reflections Series. Elaine has 4 images in The World Through My Eyes Exhibition in Barcelona April 2018. Golden Hour Series chosen as finalist in The Julia Margaret Cameron Awards fine art category, June 2018. Elaine is one of 10 artists chosen for the Sechelt Arts Festival 2018. She is part of the 5th Biennial of Fine Art and Documentary Photography in Barcelona 2018. Elaine won an honourable mention ( 4th place) for her Sechelt Tree series in the nature category of the 2018 Pollux Awards as well as 4 finalist awards. She is one of the 8 artists chosen for the Earth Art Exhibition as part of the Sechelt Art Festival October 2018. She was the winner in the Pollux Awards nature category series with her photographs called Saskatchewan Trees. November 2018.these will be exhibited in Barcelona 2019.